Remember Where’s Waldo (or Wally,for those of you across the pond)? I do, and I miss him. I also recall rushing to the library to check out one of those prized books for a chance to find the peppermint-clad man and his friends scattered throughout fantastic and entertaining worlds, filled to the brim with easter eggs and scenic sights. I Spy,another similar series, followed the same search formula, but with real items lain across a floor like an organized mess. Both were equally entertaining, but they were rare in this respect. Nowhere else have I found that same magic quality that these, especially Waldo; no other entry could simultaneously captivate mind and imagination. Then I found Hidden Folks. 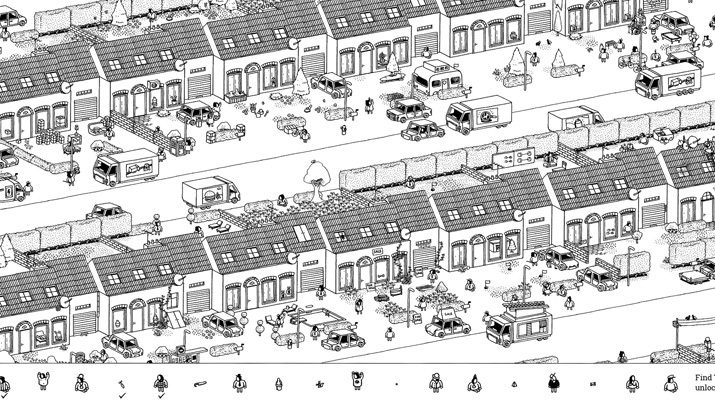 Designed by Adriaan de Jongh and illustrated by Sylvain Tegroeg, Hidden Folks is a point-and-click adventure of classic proportions, and I love it. The gist of Hidden Folks is simply searching for the folks who are hidden: that’s it. But the way this is laid out before the player is remarkable, and a good way to start our review. Immediately after launching the game, you’ll notice the art. Everything is black and white and small and compact, ever so beautifully and minimalistically. As you progress through the title, you’ll notice that each level you’ll be searching through is packed full of sights to see, little set pieces scattered across the whole with interesting people, animals, and items to see and play with. And there’s quite a few levels: 14 to be exact, with more promised to come. Zooming out reveals an entire map of places to go, nooks and crannies to scour. A bird’s eye view of the vast jungle, desert, city-scape, or factory floor to spot specific regions or familiar landmarks from a new perspective. You’re given some breathing room, but also a new appreciation for what each stage offers. Zooming in brings you closer to the action, revealing details that were wittily weaved throughout these digital dioramas, each screen bursting with life, with many moving parts and at least one interactable object. 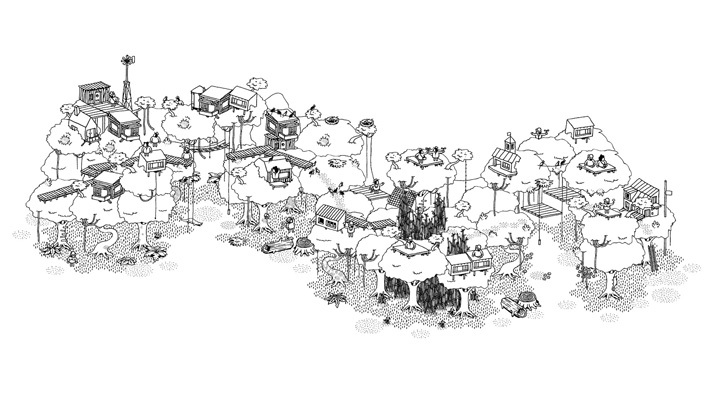 Hidden Folks is pretty and well made. Characters, while simplistic, are full of expression and charm. While many are repetitive to (in crowded areas), most are unique in their attire or behavior. These qualities help make each section feel believable, and, more importantly, enjoyable. Yes, everything is in black and white, but I won’t complain. Part of Hidden Folk’s charm is the sketchy look of its composition: a very cartoony presentation that still makes sense without color. This monochromatic makeup also helps provide the developers with a way to make Hidden Folk more accessible (along with the 14 languages it’s available in). There’s a setting for night mode, which inverts the colors, and sepia, for a more toned-down version that may be easier on the eyes for some. But not everything presented here is for the eyes. Hidden Folks comes with a variety of sounds – from the developer’s own mouths – for literally everything. Clicking a menu button? That’s a mouth sound. Listening to a chainsaw? Another mouth sound. How about that car horn? Yup, you guessed it, de Jongh or Tegroeg’s own personal mouth sound, and I think it’s great. 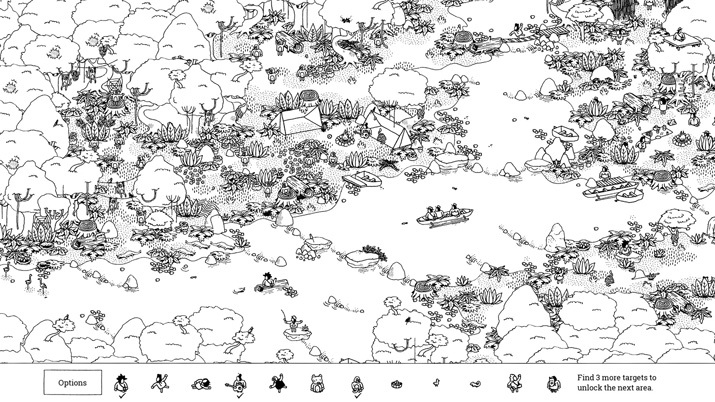 Every single person, every animal, every thing in Hidden Folks has some kind of sound it makes, passively or upon your click. Then, to add to the novelty of this cacophony of objects, is the fact that how close or far away you are affects the din; going from the racket of searching through a crowd of people for someone specific to the peaceful hum of zooming out to see the whole map and hear it all from a distance is an immediately gratifying experience that has yet to grow old, and is another proof of the amount of hard work that went into developing Hidden Folks. Unfortunately, not every moment of Hidden Folks is coated in pure joy and wonder (although a lot of it is). As is common for the hidden object genre, there is a level of complexity that can range from horribly obvious to painstakingly impossible. Thankfully, the difficulty here has a steady increase and mix, but there always seems to be one object or person I can’t find for 100% completion, and, for some of these, the provided clue isn’t clear enough (I’m looking at you, final campgrounds banana… parked in a fruit basket. Get outta here… *grumble grumble*). This can leave the player combing through locales over and over again, hearing the background noise drone on and on until they either find it or give up (I gave up… for now). Other findables require specific conditions to allow them to come on screen or for you to click them at all. This is definitely an interesting mechanic to include, especially as this is an interactive digital search puzzle, but it can, at times, backfire by prolonging the search unnecessarily if the player doesn’t read the clues and only looks around, or clicks the wrong places, or the right ones in the wrong order.